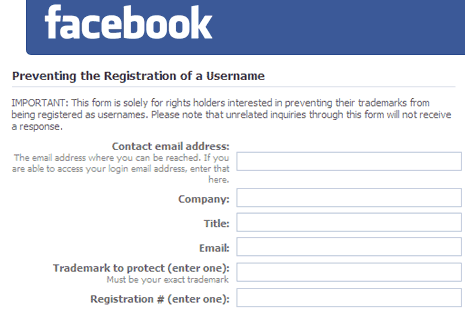 Facebook is all set to open up registeration of vanity (or custom URLs) for its users like facebook.com/yourname. However, with so many users with similar names and people ready to latch on usernames resembling top brands – Facebook is tightening the username registration process. Top journalists and celebrities already have their Facebook usernames secured and assigned (in some cases). You can also prevent any Facebook user to grab on name for which you have registered trademark. Facebook is compiling list of such usernames and these will not be available at the opening night of username registeration. Click here to submit and prevent registeration of any specific username on Facebook. You can provide valid email ID so that Facebook can later contact you to proceed with assignment of blocked username. Protect your brand username on Facebook, hurry up!